Hi guys! China Glaze send me half of their Happy HoliGlaze collection, and I'll split them up in 2 posts (there's quite a few pics and I actually ran out of remover halfway, lol). 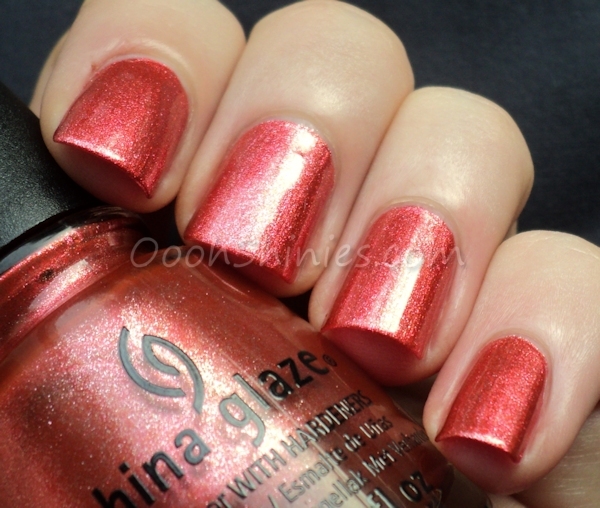 This year's holiday collection isn't as traditional, and I think that's a good move from China Glaze. Even though I much prefer the traditional reds, greens and glitters, and the silvers and golds for NYE, nowadays you see less traditional holiday colors in stores here as well (like purple and light blue, which are also in this collection). And I can imagine that staying original year after year with the standard colors is a challenge too, a red creme might be perfect for Christmas but I don't need new ones every year! So even though this collection isn't so over-the-top Christmas-y, a collection that takes things into a different direction might please a lot of people that enjoy those less traditional holiday colors :) And if you rather have the more standard colors, this collection could still be interesting for you, because they'll be great outside of the holidays too! Here are the first 3, the next post will have more blue glitters (All Wrapped Up, Be Merry, Be Bright & Your Present Required)! 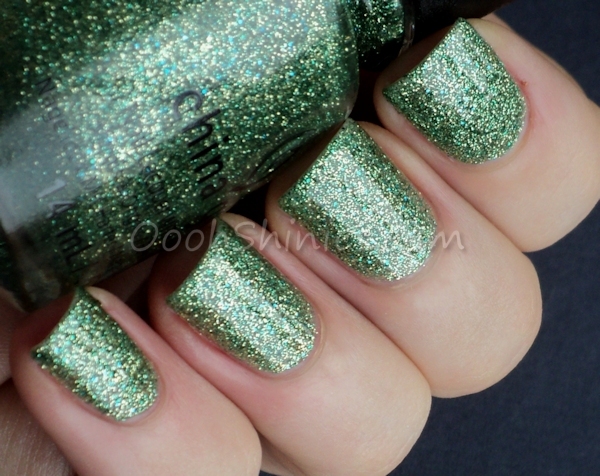 First up is a glittery green called This Is Tree-mendous, and I'm wearing 3 easy coats with top coat here. It has very fine green and golden glitters, but there's some blue in it as well, which make for a great mix! Elfin' Around is a coral foil, that leans red/orange/pink depending on the angle. I used 2 coats + top coat here, but it's a 1-coater (ohh how I love that there's almost always polish that works for stamping in CG's collections!) and the top coat didn't make much of a difference either, as more often with foils. This one also applied nice and easy. In lamplight my camera really picked up the red-ish pink in Elfin' Around, but most of the time it's more coral than you see here. This is one of the most original polishes in this collection, but if that's a good thing? 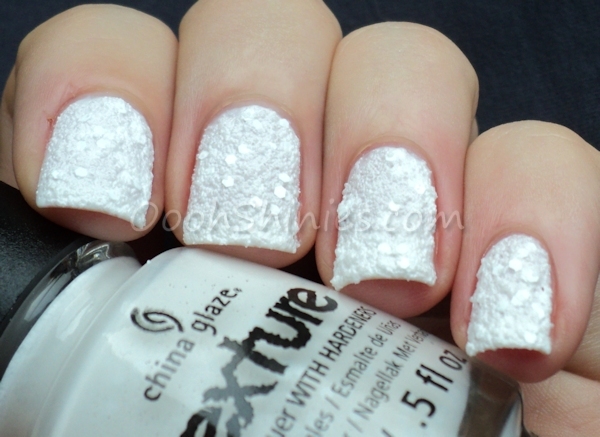 There's Snow One Like You is a texture polish with matte, white hexglitter. I'll be honest, it applied terribad, I'm wearing 2 coats here and it's uneven, chunky and weird to apply! It dried fine though and I don't dislike it as much as I thought I would, but hmm, it stays a bit weird! 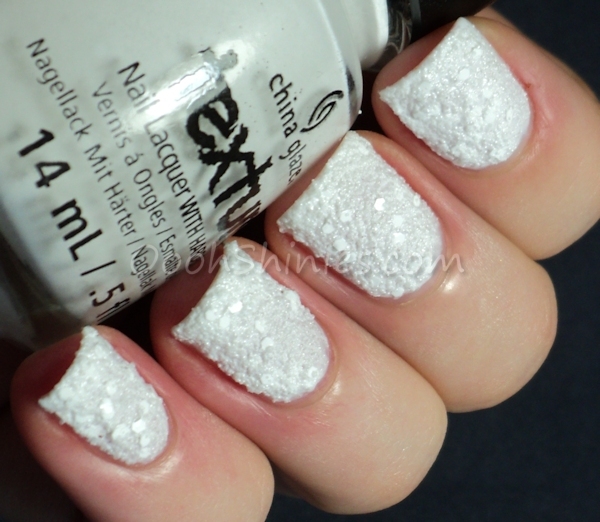 :P I think China Glaze wanted to create a snow-on-your-nails kinda texture, and it does make me think of that. Finishing this post with a quick & easy Christmas mani. Not quite sure what to think of it, haha, but one thing's for sure, you can't think of anything else than the holidays with a mani like this! If you like a 3D effect on your nails and enjoy nail art, you might like this funky white texture as well! 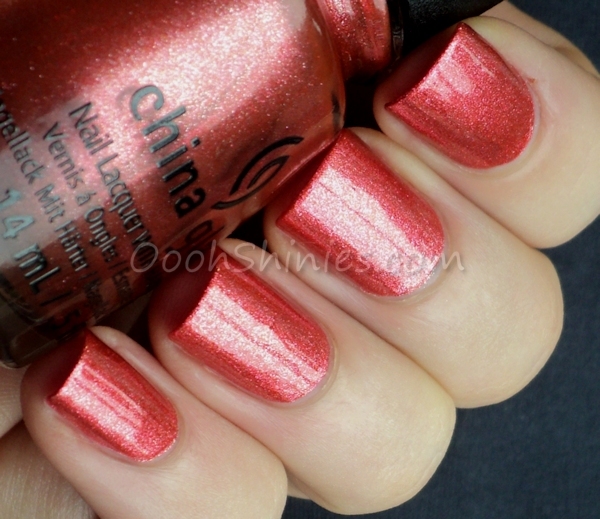 China Glaze Red Satin with China Glaze There's Snow One Like You.